My name is Matt Winick from Ann Arbor, Michigan and I have a strong interest in learning history, diversity, and social justice. In these core values or subjects, I like to learn the importance of the need to make Civil Rights stronger to reduce discrimination, have diversity to help accept people who are different or come from different background, have education reform to help make learning a better tool, and many others. Chancellor Johnson, the main reason I’m writing you a letter is to explain how I find your work as 13th Chancellor of the State University of New York to be very inspiring to me. In your current role as Chancellor of the State University of New York, I truly appreciate on how you are a strong supporter along with an advocate for Civil Rights by advocating for people with disabilities’ rights, working to make SUNY a place to reduce discrimination, and expressing the need to help protect women from being discriminated based on gender. On education reform, I liked on how you worked to expand accommodations to help students with disabilities get assistance on learning different subjects like extra time on exams or have educational software to help improve their comprehension, implement more services in tutoring to provide students with getting help on their assignments from tutors, and work to expand more Liberal Arts classes (arts, humanities, and diversity) to help make education diverse for students to learn. Also I like on how you push for more scholarship programs to help people who are low income, minorities, women, and people with disabilities who can’t afford to pay tuition along with help them get a higher education. Another thing that I like about your work as Chancellor of SUNY is how you work with corporations including small businesses to form public-private partnership to help students including grad students get in a career which they had majored in, work with SUNY colleges including community colleges to expand science including engineer research to help engage student in developing skills in the field, support hiring women, minorities, and people with disabilities to work for the college or have some leadership in SUNY, and advocate for immigration reform to help immigrants including refugees get an education along with being protected from being oppressed. Besides your work as chancellor of SUNY, I really like on how you strongly express the need to reduce climate change like support renewable energy to reduce addiction to oil with gas and expanding research in environmental to help students including researchers to find ways to reduce pollution while protect the environment. Chancellor Johnson, I have autism with a learning disability. Having a disability is hard for me because I have trouble comprehending on learning different advance subjects, sometimes I struggle to communicate my thoughts, and get teased. Your commitment to be a strong supporter and advocate for Civil Rights including people with disabilities’ rights really inspires me to work hard on my disability. 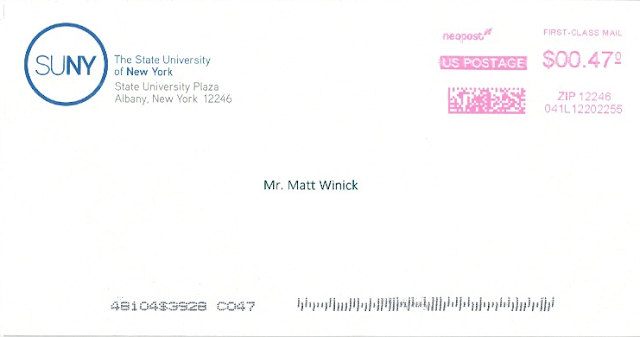 Also your work as Chancellor of SUNY gives me motivation to continue to learn history, social justice, and diversity. My future goal is to someday work in these areas to help emphasize the need for Civil Rights to be stronger to reduce discrimination, have education reform to make learning a better tool for society, push for diversity to help accept people who are different or come from a different background to improve society, and many others. On Youtube I enjoy watching videos of you giving speeches about the need to have education reform to help people learn, a strong need to protect the environment while battling climate change, and the importance of diversity in society along with education. I strongly believe that you are making a great difference in your current role. I’m very proud on how you are working hard to improve education, support social justice causes including Civil Rights or diversity, and advocate for the need to combat against climate change. 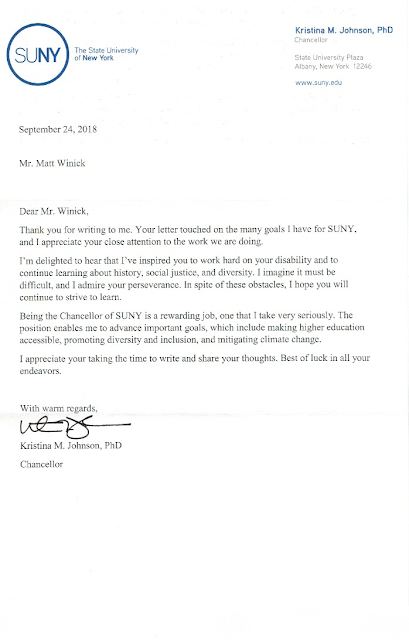 You have inspired me to work hard on my disability, learn more about your work as Chancellor of SUNY, and be motivated to continue to learn history, diversity, and social justice. Thanks for taking the time to read my letter, working hard to make a great impact on society including education, and inspiring me. I wish you the best to continue your role as current Chancellor of SUNY to push and advocate for common sense ideas.